Growing up, my mom wouldn’t allow any sugary cereal into the house except for the exceedingly rare box of Cinnamon Toast Crunch, which we ate right out of the box like candy. Because it is candy. I was otherwise opposed to cereal. I never liked my mom’s choice of cereal—the healthy, fortified, fiber-rich stuff. On a more fundamental level, I couldn’t understand the appeal of cold milk and soggy stuff in a bowl. It’s like cold soup! Can anyone back me up on that?! Plus, I hated the sound of metal spoons scraping against bowls so early in the morning. I swore off the whole category and switched to toast with peanut butter. I crinkled my nose at the cereal bar in the dorms and carried on in my toast-eating ways until junior year, when I moved to France for a semester abroad. There were no toasters in the dorms. Also no refrigerators or microwaves, just a stove. I stored my food in a cabinet in my little room and quickly learned how to get by. At the French grocery stores, I found milk that didn’t require refrigeration until opening. I also discovered on my own that I could just not refrigerate the milk for a day or two after opening. (I’m fine, Mom!) Then my friend Mandy introduced me to the magic that is the French cereal aisle. The French know how to make some tasty, chocolatey cereal. After all my years of vocal cereal-hating, I survived on cereal in France. After all that, I came back home and fired up my toaster again. We just don’t make cereal like the French do. Eventually, I expanded into oatmeal and egg-y things and homemade muffins. I learned how to make granola, which is now a staple, and here we are now with muesli. I wasn’t sold on muesli until I ran out of my yogurt and homemade granola in Austin. Ali offered me some of her store-brand toasted muesli and almond milk and it turns out, I like cold soup when toasted muesli is involved. 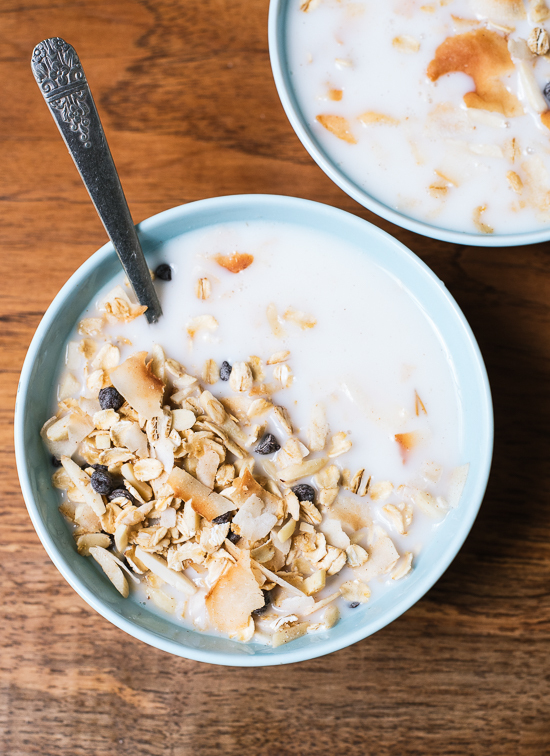 Muesli is like a healthier, lightened-up granola, which isn’t to knock my beloved granola but to point out that muesli has significantly less oil and sugar in it. It can be made with no oil or sugar at all, but a little bit goes a long way in the flavor department. I treat muesli like granola and mix it with almond milk or yogurt in the morning. You can store extra muesli in a bag in the freezer and grab it like you would a box of cereal. Most muesli recipes call for just plain, raw oats, but if you want to make phenomenal muesli, you need to toast the mixture in the oven. The heat brings out the best in the oats, almonds and coconut. The oats crisp up a bit, so they retain more texture as well, which I love. I’ve been playing around with muesli flavors like I have with granola. In fact, you could take inspiration from any granola recipe and turn it into muesli using the recipe below as your guide. Muesli reminds me of cereal, which reminds me of France, so I decided to add a reasonable amount of tiny chocolate chips to the mix. It’s basically the Almond Joy of muesli. Bob’s Red Mill sent me some of their gluten-free rolled oats, so I used those to make muesli and the muesli turned out beautifully. Oats are inherently gluten free, but often contaminated in the field from nearby crops or in processing plants where flour is present. I’m so glad that Bob’s Red Mill offers meticulously tested gluten-free oats so that I cook my favorite oat-based waffles and pancakes for my gluten-free friends! Simple and delicious toasted muesli with almonds, coconut and dark chocolate. This muesli is a healthy, homemade breakfast. Feel free to change up the mix-ins; just replace the almonds, coconut and chocolate with about 3 cups nuts and/or dried fruit (add the dried fruit after the muesil has cooled, like you do with the chocolate in the recipe below). Recipe yields approximately 7 cups muesli. Preheat oven to 350 degrees Fahrenheit. For easy cleanup, line a large, rimmed baking sheet with parchment paper (I was out, so I did not and it was fine). In a large mixing bowl, combine the oats, almonds, coconut, salt and cinnamon. Mix well. Pour in the maple syrup, coconut oil and vanilla extract and mix well. Do NOT add the chocolate chips; we’re saving those for later. 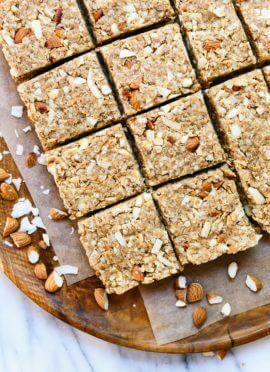 Pour the mixture onto your baking sheet and bake until the oats and coconut flakes are lightly golden and fragrant, tossing halfway, about 15 minutes. Let the muesli cool completely before mixing in the chocolate chips (if you add them too soon, the chips will melt and you’ll have a delicious mess of chocolatey muesli). Serve individual portions in bowls with almond milk or yogurt. I like to let my muesli rest for a few minutes so the oats soften up a bit. Enjoy! Store cooled muesli in a freezer-safe bag with the air squeezed out. It keeps best in the freezer (no defrosting time required). Recipe roughly adapted from my cranberry orange granola. Make it vegan/dairy free: Be sure to use dairy-free chocolate chips and non-dairy milk, like almond milk. Disclaimer: This post was created in partnership with Bob’s Red Mill and I received compensation for my participation. Opinions are my own, always. Thank you for supporting the sponsors who support C+K! Hi, I just wonder why you don’t add Turkish cuisine recipes into your website. You will not regret. Hi Ebru. I’m sorry, I haven’t had the chance to experience much Turkish cuisine so I haven’t attempted any Turkih recipes at home. I’ll look into it. I’m still not feeling “cold cereal” for breakfast. I too have never been a cereal girl. It looks like slop and not what I want first thing in the morning. I was with you until you started talking about mueslie. I understand you want/need to make money but this feels like a sell out. Astrid, I’m sorry you feel that way. I just finished a bowl of muesli for breakfast and thoroughly enjoyed it. My preferences have changed over time and while I still don’t like most cereals, I really love toasted muesli. I would never, ever post a recipe that I don’t enjoy on my blog! 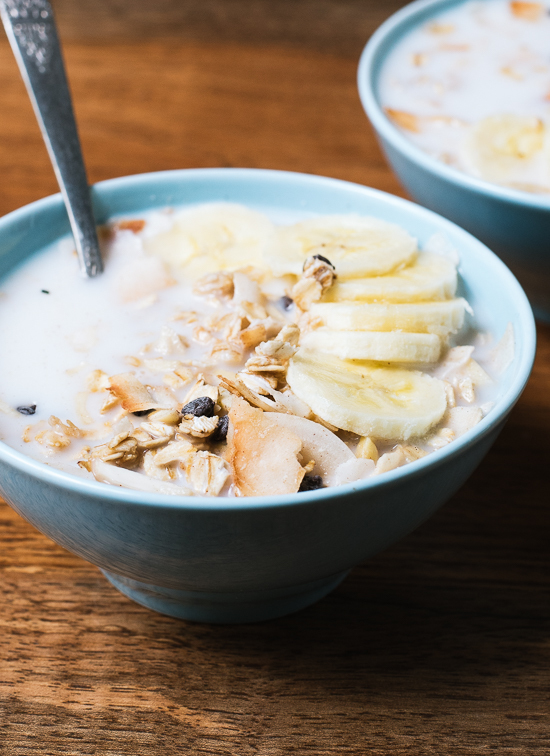 All I was asked to do is create a recipe with old-fashioned oats (which could be a wide variety of things), and I made muesli because I love it and wanted to share it as the healthy and delicious breakfast option that it is. Wow, your comment is rude and really not necessary. Just because you don’t care for something doesn’t mean it shouldn’t be on the internet. I am glad to find this recipe..as I’m sure many other people are as well. Kate, I will be making this today. Thank you for posting. Thank you, Amy! Hope you’re enjoying the muesli. I loved this. Easy to make, travels well, tastes great. Love your website! thank you. Lol because everyone has the exact same taste buds as you and needs your input. False. We don’t. Fine recipe. I’m currently not allowing myself to have oats but I’ll bet this breakfast kicks pop tarts in the face. Lol. Astrid…. really! SMH. I never liked muesli until the Tuckshop chef (I work at a school) started making muesli with Greek yoghurt and fresh fruits. Aaaaaand sold! Going to get all the ingredients now and start making my own. I love this one because of no raisins (phew) and chocolate chips! Wait what? She added chocolate? YES! Harsh words for so early in the AM! I think it looks great, thanks for the idea. Agree! I love muesli (only ate it at my grandmother’s with warm milk in the winter) and am going to try this. Nothing wrong with a sponsored post once in a while if you make something you genuinely like. Don’t worry, you are not a sell out! I discovered muesli as an adult, and I love it. I can’t wait to try this recipe. Your blog, Naturally Ella, and Smitten Kitchen are my all-time favorite blogs. Your recipes always turn out great, and they inspire me to make healthy, delicious meals for my family (your mango salsa recipe saved dinner last night!) Thank-you for sharing your great ideas! Hooray, thank you! Really appreciate you saying so. Glad you enjoyed the mango salsa! Thank you for your post on muesli. It looks delicious. Sometimes the most simple recipes are the best! Do you know if there is a certain kind /brand of chocolate chip that is ok for a plant based-oil free diet? Hi Linda! I agree, simple recipes can really be the best. I am not familiar with the specifics of an oil-free diet, but I used Enjoy Life brand’s vegan mini chocolate chips (http://enjoylifefoods.com/our-food/baking-chocolate/chocolate-for-baking-mini-chips/), which I believe I bought at Target. The ingredients are simply: Evaporated Cane Juice, Natural Chocolate Liquor (Non-Alcoholic), Non-Dairy Cocoa Butter. Hope those will work for you! This is likely so late that it won’t help, but maybe you could use cocoa powder instead? Also, carob is a good alternative, too. Thank you for this recipe! I finally (recently) got on the granola-making bandwagon, mostly to make more healthful cereal available for my husband and daughter. We lived in Germany for half a year, and while there, learned to like muesli. I’ve intended to try making it, and voila – here is a recipe! Many thanks. And to previous posters – yes, its look is not elegant – and no need to be so harsh. 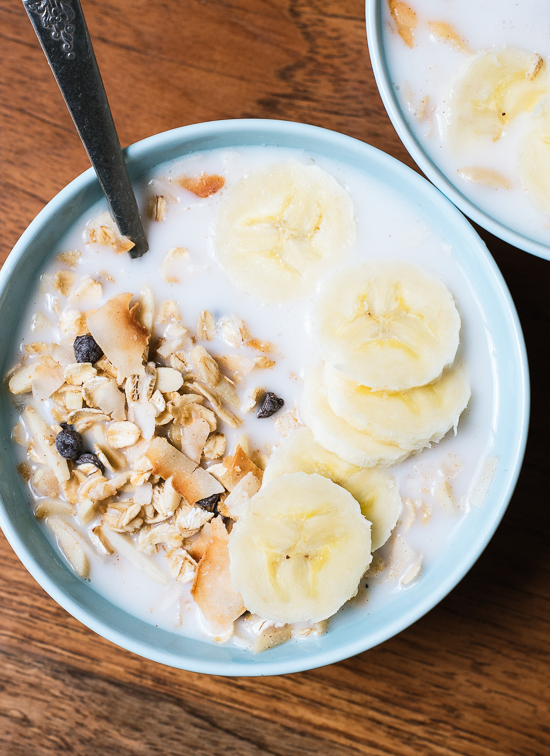 Consider that muesli a basic whole grain food, healthful, and while for some an acquired taste, once acquired, it makes for a lovely and simple morning routine. Thank you, Leslie! I hope you all enjoy this muesli. Any dish that includes chocolate for breakfast has my attention. Sounds delicious. And Cookie looks ever so hopeful of snagging a morsel or two — so cute! Yum, Kate, this looks amazing! I’m on a muesli kick right now, so it’s extra perfect! I had one question, though. I am used to eating muesli after it has soaked overnight, and I was wondering if you thought I could do that with this? If you soaked it overnight, would you add more liquid? It sounds good the way you suggested serving it, too! Thanks! Hi Abbie, yes, you could soak this muesli like you would any other muesli! I think it really boils down to personal preference. I like mine to retain some texture, so I just let it rest for a couple of minutes. Hope you’ll give it a try! Just thought I would comment to say that not only have I tried it, I LOVE it, and it has become a staple for me! I have even doubled it before so I could have twice the amount for the same amount of mess! Thank you so much! Ah muesli! One of my most favorite breakfasts ever. Love this toasted version too! I lived on sugary cereal as a kid (and loved toast too!) but I have grown to love more healthful morning meals like oats and muesli. I used Bob’s Red Mill oats often too. I love the look of this particular recipe because I’ve never tried toasted muesli before. Your photos make me want to dig right in! I love all the flavours in here! so delicious! You’re lucky to have a mum like that. Mine bought me nutella, breakfast cereals, piadine (it’s like a wrap made with white flour and oil/lard) filled with scamorza (cheese) and speck, chocolate and so on. Luckily I started to learn about healthy food and now she eats better too! i LOVE museli! i was introduced to it while studying abroad in England and haven’t been able to find a good sub. Thanks for the recipe! I’ve been seeing so many recipes for granola on blogs, but I just can’t stomach the amount of sugar in them. This, however, I’ll do! Thanks! Thank you, Stephanie! Hope you love it! Crazy talk! This looks and sounds fantastic! I love your blog and all of your recipes. I can’t wait to try this out- it’s perfect for this warm weather I’m experiencing! This looks like a perfectly lovely breakfast. I will most certainly be trying this. This is like cereal for grown-ups, and I love that is is lower in sugar. Wow, people have strong feelings about muesli! I’m a relatively new reader to the blog and I’m slowly working through your recipes, Kate and they’re all huge hits in my home. My carnivore husband ate your honey-almond granola by the handful. P.S. regarding Turkish recipes – I made a Turkish bread called “Tahinli ekmek” that was a lot of work but AMAZING. they’re like cinnamon rolls but have a tahini/brown sugar/cinnamon filling and are rolled differently. My sister and I loved Cinnamon Toast Crunch growing up. But muesli is actually my go-to breakfast every morning these days. I cannot wait to try this delicious-looking recipe! wow people are pretty harsh even on food blogs… it’s just food not religion haha anyway, i love muesli. and i love cereal. i don’t feel you on the cereal front. nothing like a good bowl of cap’n crunch w/ berries when you’re in the mood. the trick is… pour a little at a time. of course then you eat half the box because your mind thinks you haven’t eaten as much as you really have. =/ i don’t think i’ve ever had muesli with chocolate in it though. definitely a win! Thanks, Cam! I appreciate it. I think I missed the boat on Cap’n Crunch, but I like your pour-as-you-go tip! I don’t consider myself a muesli person (though I dig me some granola but when you put it like that… muesli being a healthier granola, how can I NOT try it?). You now have me salivating and I just ate lunch and am full so that’s SOMETHING new!! I’m going to have to make a variation on this (son’s allergic to coconut and I want him and everyone else to be able to join in on the fun) next week. And I’ve add almond milk to my grocery list. Thank you for giving me something exciting to look forward to with breakfasts again. It’s the one meal of the day that I cannot miss but also the one with which I get into a rut most often. Thank you, Lisa! I think you’ll like this muesli. It’s a little more granola-like than most. Enjoy! My first thought as I was scrolling through these pics is that this looks like something I’d actually eat for breakfast. Not some stylized crazy breakfast thing that no one has time to make. Love that! Keep it up. Thanks, Tessa! That’s what I was going for. I think breakfasts should be super simple, especially weekday breakfasts! Do you have to put muesli in milk to eat it? Or can you eat it straight like dry cereal (sans milk)? I don’t like putting milk in my cereal, so I’ve always stayed away from muesli because I only ever see it served in milk. Hi Mimi! I just sampled the muesli straight from the bag and it’s great that way. I don’t know if un-toasted muesli would be as enjoyable since it’ll be even more chewy, but I really enjoyed the version you see here. I’ll have to try making it! Wow, somebody (Astrid) woke up on the wrong side of the bed! Please don’t listen to the bullies on the web that go mean on lovely people like you. I would like to say that I am always inspired by your recipes and photos and it was a nice change up from granola to see your toasted muesli recipe today. Keep up the great work, and don’t let a mean comment ruin your day, week or month! Thank you very much, Jerilyn! Oh my gosh I totally agree with you about the cereal thing!! My mum would only buy healthy stuff too and also now I really dislike cereal with milk and agree with the cold soup thing. If I have cereal (granola etc) I eat it on its own or with yogurt etc. Never with milk. Oh dang, that sounds good. This actually looks like the perfect after school snack. Delicious! I always enjoy your recipes. Have you, or will you ever be writing a cookbook? How long will the muesli keep in the fridge? Hi June, thank you! I am hoping to work on a cookbook soon… we’ll see. :) I recommend storing the muesli in the freezer (in a freezer-safe bag, with the air squeezed out and sealed). It should keep well for a few months! That look delicious and I cant wait to make it this week end, I always loved muesli! Thank you for all your wonderful recipes Kate, I love every single one of them. The roasted brussel sprouts pizza is also next on my list! I am also looking forward to your monthly list of fresh produce, it is my kitchen bible!! Thank you so much, Cecilia! Please let me know how the pizza and muesli turn out. Just a head’s up, my May produce guide will be a few days late, but it’s coming! So glad you appreciate the guides. I’ve been on the hunt for healthier breakfast options, and this sounds divine! I could live on cereal alone! I recently fell in love with muesli and was JUST thinking I’d like to mix it up and try my hand at creating some of my own flavors. 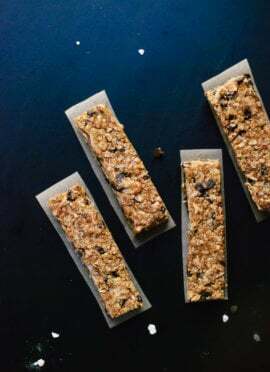 This looks like just what the Dr. ordered – I might even try it with some dried blueberries instead of chocolate! Thank you for posting such beautiful and accessible recipes. I visit your blog often. Thanks, Jess! Dried blueberries sound like a fantastic substitution. Thank you for visiting my blog and saying hello! Yum! I love muesli and this looks like a delicious recipe, Kate. I think the secret to avoiding ‘cold soup’ is having lots of crunchy bits. I also prefer less milk and have a big dollop of natural yoghurt instead. I’m also a huge believer in dark chocolate at breakfast time! It tastes so good and is so good for you. Will definitely be giving this a try. I never realised that granola and muesli were different. I always just thought granola was ‘American muesli’ (Aussie here). Hmmm….. Thanks, Sarah! I’m with you on crunchy bits and yogurt. Our granola over here is usually more clumpy and sweet. Muesli is more like plain oats, although I toasted mine and added a touch of sweetener. I am a lover of both granola and muesli but I wasn’t really sure of the difference until you pointed it out. I guess my homemade granola is more closely related to muesli then, which is what we call both granola and muesli here in Australia. Confused yet, me too…. Thanks, Amy! Granola is usually more clustered, at least over here in the States! Hope you love my muesli. Thank you, Ellen! So excited that I made the list. I never really liked muesli. :/ But I’ll give this a go! Mmm, this looks amazing. I’m a huge muesli fan! My parents also wouldn’t let us have any sugary cereals which was annoying at the time, but I’m thankful for now! I will try this for sure. Toasting always bring out more flavors. I don’t do dairy because I’m lactose intolerant but am slightly curious about almond milk. 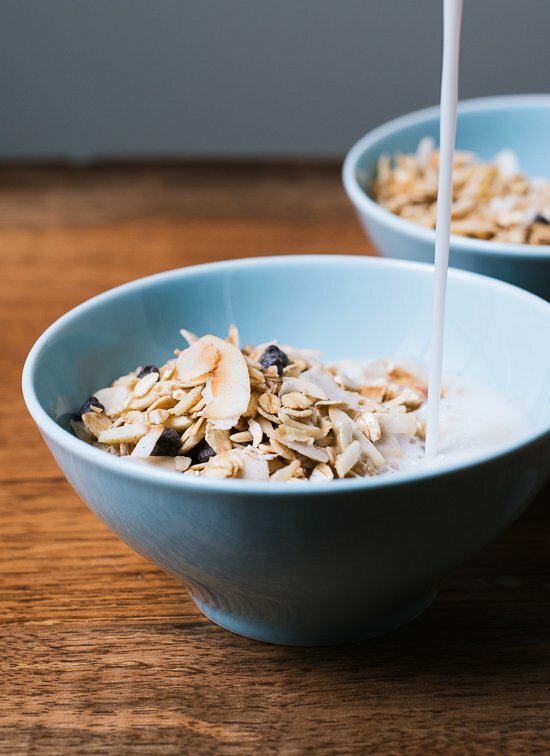 I’ve lived without having cereal/milk/yogurt for 4+ years so I don’t see myself jumping to almond milk but wonder about its ease with stomach issues. Any ideas? This looks delicious! Who can resist coconut, almond, AND chocolate?! I’m the type of person who eats the same thing for breakfast for weeks (I’ve literally been eating toast + coconut oil + raspberry jam + chia seeds for the past 4 weeks) until I get bored one day and then move on to a “new” breakfast. This muesli might be next in line after my toast stint haha! Well, your latest breakfast sounds epic! I’m going to have to give that a try. Hope you love the muesli, Emily! Thank you so much for sharing! I’m living in Germany right now and muesli has moved granola to the sidelines for me. I love granola, but hate all the added sugars in most types. Quick question: Is it okay for me to not toast the oats? Or will the muesli turn out differently because of the maple syrup and such? Hey Claire, I think the muesli will be a little wet and won’t keep as well if you don’t toast the oats. Plus, toasting the oats brings out so much more flavor! OMG, this is amazing. I’ve never had muesli, but thought I’d give this a try. It was good that I decided I needed a bowl mid-afternoon. So glad to have a filling, heathy vegan breakfast option. Thanks! I made this yesterday and had it for breakfast today! It made my apartment smell amazing and I am still full at 11 AM, which is the ultimate breakfast test in my book. Thank you for such wonderful recipes Kate. Hooray! Thank you, Kelly! We had matching breakfasts this morning, btw. I made this recipe last week and it is so delicious. 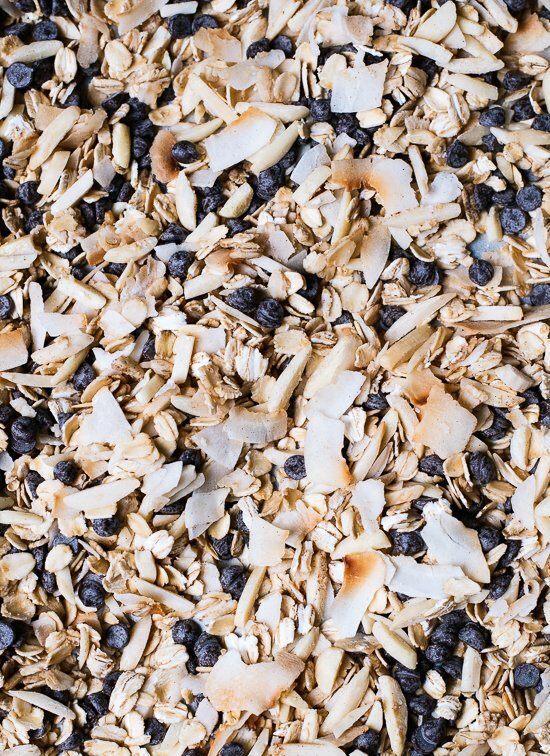 My girls love muesli and I usually soak my oats overnight with coconut yogurt and dried fruit. This was totally calling my name. It is my only cereal since I don’t eat cereal. I also admire people who can make money doing something they love and you are one of them. Thanks for this recipe. Thank you, Flor! So glad you enjoyed my muesli. Thank you for your kind words, too! Hey Emily, I’m sorry to hear that. I’ve heard that a small percentage of gluten-free individuals are also sensitive to compound found in oats. I wonder if rolled quinoa would work? That’s the best substitute I can think of. If you give that a try, please keep an eye on it while it bakes (in case quinoa flakes toast quicker) and let me know how it turns out! I can’t wait to make this for my girls for breakfast! I have a delicious granola recipe, but I feel like it has far too much honey to be anything more then an occasional treat. I try to keep my girls under the reccomended 3 tablespoons of added sugar per day, so it is usually fresh fruit and Joe’s O’s or steel cut oats for breakfast at out house. I hear you, Aviva! So glad you appreciate this muesli. I love it! Absolutely love how easy and toasty this is. I like it with homemade cashew milk. My son just eats it straight up with a spoon. ha! Hooray! Glad you two are enjoying it! Homemade cashew milk is the best. I have never heard of Muesli; however, looking at the recipe and steps makes this very tempting and I want to try it. Do you know if I can use old fashion quaker oats for this recipe to get the same results and taste. Hi KD! Yep, those will do! Thanks, Bridget! Great idea to add chai flavors! Finally got around to making this over the weekend and it does not disappoint. It’s so so so delicious i have to stop myself from eating it by the handful. I used roughly chopped pecans and shredded coconut instead of flaked. It worked out really well. To me, it’s a bit sweeter than store-bought muesli, but not as sweet as granola, it’s perfect really. I will be making this again and will try out some other additions like raisins or cranberries and maybe some different types of nuts. Thank you, Lisa! I’m so glad you enjoyed the muesli. I ran out and need to make another batch, pronto! Do you think I can sub olive oil for the coconut oil? I’m all out. Yes, olive oil should work just fine! So I was just wondering if you knew any oat free oatmeal…? Hi Jadzia, I’m sorry to hear that! I know that rolled quinoa exists, so maybe that would work for you? You do have great friends! So glad you enjoyed it, Stacy! This is absolutely delicious. 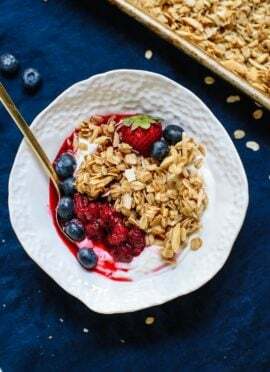 It scratches the granola itch–crunchy, lots of different tastes and textures–but I love that it’s less sweet and less greasy than even “healthy” granola recipes (which are usually healthier than traditional, but still use a lot of sugar!). I don’t like the chewiness of normal muesli, so the toasting step was key. One thing I’d do differently is drop the oven temp to 250 or 300 and bake it for longer. My coconut started getting dark before my oats were toasted all the way. I turned it down partway through, which helped. Just made this muesli and it’s absolutely delicious!! 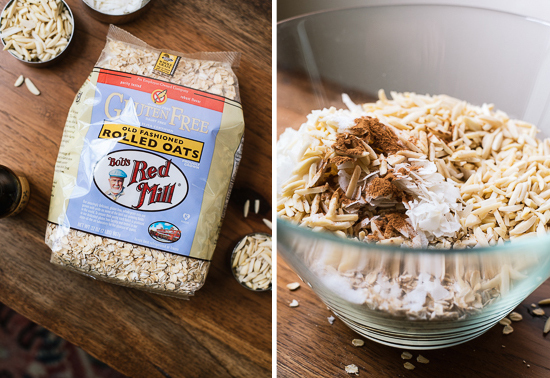 Have never tried gluten free oats but they (and this recipe) will now be a staple in my household. Thank you, Ewa! Glad to hear it! Hi Kate! I just recently turned vegan and your recipies are simply amazing ! Loved the butternut squash pasta! This is an off topic question but what kind of dog do you have? thanks!! This is a complete staple in our house. I started making it a few months ago and haven’t looked for anything else since! I made this tonight! I never planned for my husband to eat it because he’s pretty picky. He smelled it baking and had a big bowl full right out of the oven. We both absolutely loved it! Thank you so much for this awesome recipe! Happy Thanksgiving!! Thank you, LiLi! I’m glad you both enjoyed the muesli, yay! Hi Joy, thank you for sharing. I’ve heard of the health benefits of soaking grains and should probably take advantage of them more often. I wanted to be sure to emphasize that this cereal is a great alternative to the more processed cereals on the shelf, whether you soak it or not. Sometimes, I worry that suggesting that oats (or lentils, etc.) are healthiest after soaking overnight will overwhelm people who are starting to eat better because it implies that they aren’t healthy if you don’t have to soak them… and not everyone has the time/energy/foresight to soak ingredients overnight. Just my two cents here! Hi Joy, I’m glad my reply was well received. All my best and happy holidays! So very yummy. I used what I had in my pantry in addition to your items. I replaced to oats with muesli, because that is what I had laying around. Then I added wheat Chex, cashews, dried wild blueberries and dried cherries. Over soy yogurt it was a spectacular dessert. Thanks so much. Sounds great! Thank you, Cheryl. The fact that I’ve made 3 batches within the past week should attest to the popularity of your muesli in this house! Now I have the freezer stocked up for my marauding husband. 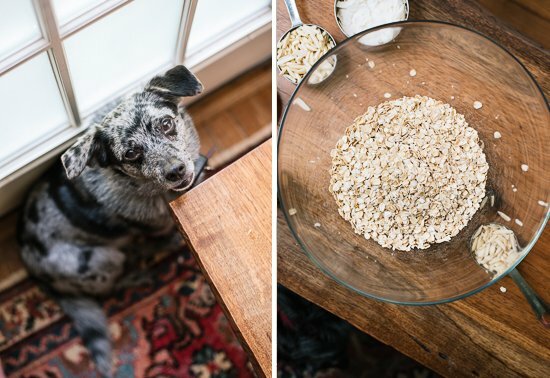 Who knew he’d forgo his favorite(too sweet, high fat) granola for muesli?! We mostly use it on my homemade Greek yogurt but have also found ourselves heading to the freezer to grab a handful as a quick snack. Using your recipe as a guide, I’m successfully reducing excess inventory of pine nuts(left over from pesto making last fall), dried cherries(from family in Traverse City, Michigan), pecans, walnuts, apricots,flaxseed meal, chia seeds and crystalized ginger. The next batch might have quinoa in it, just to see if it’d work! I’ve been avoiding baking as I’ve been seriously dieting for the past 8 months and am glad to have found a way, through your recipe, to use these items without encasing them in butter, brown sugar, and icing. Haven’t made this in a while and had forgotten how delicious it truly is. This time I made 1 1/2 of the recipe so in addition to the 4 cups of oats i used 1 cup rye flakes and 1 cup all bran cereal. I used pecans (instead of almonds), increased the amounts of coconut oil, maple syrup, vanilla etc accordingly. I also added in sunflower seeds and for the ‘sweet’ portion used cranberries, dates and raisins. This muesli is such a great way to start the day and it’s 1000x better than anything you could buy off the shelf. Thanks for this recipe Kate! I was wondering if you can cook the mixture in a pan rather than the oven? I was looking for a homemade muesli recipe this morning and luckily came across this toasted version. I just had to tell you, it’s brilliant! So easy, so quick, and SO good! As much as I love granola, I wanted something lower in calories, sugar, etc. and this fit the bill perfectly. I have to admit I pretty much eyeballed the ingredients, especially since I had no coconut on hand, but the recipe is totally forgiving and turned out just great! In addition to the almonds, I added cashews, sunflower seeds, pumpkin seeds, flaxseed, golden raisins, and dried cranberries, all of which made up the volume for the missing coconut (and then some!). I omitted the chocolate but added a little nutmeg in addition to the cinnamon. Just finished a bowl and mmm-mmm! Such a great idea– toasting it makes ALL the difference. Yet another inspired recipe… Thanks so much! Love this recipe, I’m currently going through Chemotherapy and this is a great way to avoid Sugar and get some proper nutrition into you at the start of the day. I’m making it as I type this (so I can remind myself of the recipe) and can’t wait to tuck in. The smell is gorgeous. I do add Gojo Berries and Chia seeds towards the end of the cooking as they burn easily and take bitter if overcooked. 5 mins max. Thanks for putting up the recipe, we love it in our house. I appreciate the recipe, as I had decided most granola recipes were sweeter and oilier than I needed it to be, and I will make it again. Just want to put in my $.02, though, that the result is extremely salty. A half-teaspoonful would be plenty – unless you meant kosher salt to be used? – in which case maybe that should be specified. Will try this recipe. Only I will have it with coconut milk. Thanks for this recipe! A friend recently gave me some homemade muesli and it was so good, I thought I would try to make my own. I love cereal (I’m another one who also got only healthy cereals as a kid) and would eat Grape Nuts every day for breakfast if I could. Sadly they are hard to come by in Germany, where my family is living now. Muesli abounds here but there is something nice about making your own and being able to customize it, plus it’s fresher. I made yours last night, without coconut, subbing chopped cashews for almonds, and adding sunflower seeds and chia seeds (my first time with chia — always seemed too faddish but turns out they are fun). I added dried cranberries after the roasting instead of chocolate chips. The key is definitely the roasting, and having a variety of textures. Delicious with plain yogurt, a little milk and raspberries. I’m looking at my empty bowl now and debating getting just a leeetle bit more… :) Thanks again and Guten Appetit! Thank you, Emily! I’m so glad you found my recipe. Your version sounds delicious! Oops! I just fixed it. Thanks, Emily. Love this! I’ve been on an oat kick lately. Granola, granola bars (yours rock btw) and now muesli. I’m not a coconut fan so I left that out, I also can’t handle maple (it’s a smell thing) so I subbed honey. Love, love love chocolate, probably one reason I loved your granola bars so much. This muesli makes a wonderful cereal, warm or cold, and it’s great with my homemade Greek yogurt. Add banana slices and I’m in chocolate-banana heaven!! Thanks for a great recipe. Thank you, Cat! You’re definitely in the right place for oat recipes. I can’t get enough! So glad you’re enjoying them. I found your muesli recipe and have made it numerous times, with some adjustments. I used the chocolate chips but didn’t care for them, although I’m a chocolate lover. I like to add chopped dates and some candied ginger to the mix and I don’t use the coconut oil or the maple syrup. I figure we get enough sugar without adding that. I do love the basic recipe and yes; toasting the oats is so much better. Thanks, Linda! Your variations sound great! I just made a half recipe just to try this. It was delicious–much tastier than the untoasted meuseli I usually eat. Will definitely make this again. Just got back from New Zealand where everyone has their own homemade muesli. After searching out options, yours is the closest to what we had… can’t wait to make it! Sounds delicious! And so nice that it reminded you of home. How much of the muesli do you consider a serving? I know it makes 7 cups total but how much do you eat? Hey Anna, I never measure out my servings exactly—I just roughly guess how much it will take to satisfy me. I’d guess that I’d eat around 1/2 to 3/4 cup, depending on how hungry I am and what I’m serving it with. Thanks for this great recipe! My 11-year-old daughter likes it, which is a huge bonus — it’s always hard to find healthy things she’ll eat for a quick breakfast. We didn’t have mini chocolate chips but found that it was sweet enough without. For our first batch, we added dried cranberries. Yum! So happy you and the kiddo enjoy it! Dried cranberries sound so good with this, I’ll have to try that next time. Excellent recipe! I added one cup of wheat flakes, used about 3/4 tsp of penzey’s cake spice, and omitted the chocolate chips. I’ve been eating it with plain kefir. So delicious. Making two batches again today- one with almonds and one with walnuts. Thank you! I have had to search for Bob’s Museli where I live and love it but it is costly.. so excited to have your recipe AND will buy Bob’s uncontaminated oats. I so much appreciate valid indorsements – it is the reader’s choice and you are upfront. Koodos, ignore negative and go forward!!! Just discovered you while searching/finding your lentil soup recipe – will try today. Thank you, Marie! It’s nice to hear that you appreciate what I do. I’m glad you found my site! Have a great day. I have made this recipe over and over again and I love it! I keep a bag of it in my pantry at all times. It is the perfect addition to my Siggis yogurt and a much better choice than sugary granolas. Thanks for a great recipe! I’m so glad this is on regular rotation, Carley! Thanks for the kind words. I’ve always thought the difference between Muesli vs.Granola is that Muesli is uncooked, and Granola is baked. So when you “toast” the grains in this Muesli, does it then become Granola? I’m not trying to be a smart a., just wondering why you chose the name (?). 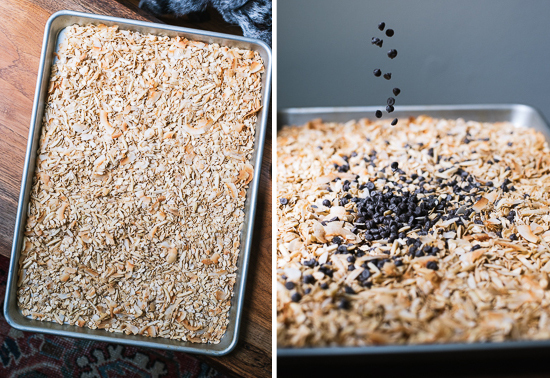 I love Granola, and make (& bake) it often…my grandsons love it and call it “GaGa’s Granola” :) They are now in college, and it’s an excellent addition to their care packages. Thanks for all your great recipes. I love your “Love real Food” cookbook, as well. I love this recipe. Do you know how many calories per cup? Unfortunately, I don’t have nutritional info available for all my recipes just yet. In the meantime, here’s a nutrition calculator that might come in handy. I like muesli with warm milk. I never tried to bake muesli, tho, but will give it a try someday. I live in a country where oven is never a staple for daily cooks or if you don’t bake cookies daily. So getting my oven out of the cupboard and getting it ready will take effort. Anw, scrolled down your post, scroll, scroll, DOG!! !, scroll, scroll, scroll, lolz. Cutie puppy! Thanks for sharing the recipe. I hope you get a chance to try this, Sekar! Cookie says hello! I made this recipe and really love it. I am a big fan of muesli and was craving the kind of muesli i ate when i visited Switzerland. This was easy to make and toasting the ingredients in the oven added a nice crunch. I’m glad you liked it and that is was comparable to one you had in Switzerland! If you would like to leave a star review, I would appreciate it! Hi Kate, I tried giving the recipe 5 stars but it doesnt seem to work with my iPhone. Just got back from a wonderful vacation where we became fast friends with an amazing vegan couple. She turned me on to the delicious muesli available at breakfast, and I’m hopelessly smitten! Your recipe is in the oven as I type…love the toasting, and can’t wait to top it with frozen blueberries and strawberries, maybe a few golden raisins and sunflower seeds. I omitted the oil and will try to resist adding chocolate…we’ll see how that goes. Thanks for a great recipe. I loved this recipe! I just made it for breakfast except I added help, chia, and flax seeds. Also, I didn’t cook it with coconut oil and maple syrup. Instead I just drizzled a little syrup over my individual bowl. It was SO good! I make this every week and eat it like cereal in the mornings. I also eat it as a snack. So healthy and yummy. Thanks, Christine for the review! I love your toasted meusli with almond(i leave out the choc in favour of dried fruit and haven’t eaten store bought meusli since I discovered it. I’m sorry Christine! I was having issues with the nutritional info previously, but believe it should be fixed now. Try refreshing your browser. If that doesn’t work, clear your history and reload. That should hopefully do the trick! This has become my all time favorite breakfast. It tastes so good and this batch lasts me about three weeks. It goes well with dried fruits too. Thank you so much Kate for this recipe! You’re welcome! I’m happy it’s a favorite. I appreciate the review. I made this recipe yesterday and absolutely love it, as is! The hint of chocolate worried me; however, loved it. Have used it so far on yogurt and , as a cereal with milk, and on cottage cheese and fruit. Thank you so much for sharing this gem, I love it! You’re welcome! Love the combinations, Carla. For those who don’t like a ‘mushy’ texture, I add about 1/3 to 1/2 cup unsweetened low fat yoghurt to about 1/3 to 1/2 cup of the muesli. Rather than stir it in, I enjoy the chopped fresh fruit and other ingredients. I hope this helps the person who didn’t like the “slop” – I don’t like that either. Just bought a bag of Bobs Red Mill European Muesli & decided to toast up & halve this recipe. Mine turned out quite salty (& I love salt). Salvaged most of it by adding another cup & a half of oats/nuts/syrup prior to cooking but still had some overpowering salty bites. Next time I will quarter the salt as the coconut oil & maple syrup looks perfect. Thanks for the recipe. I’m sorry to hear you didn’t love it! Great idea to adjust to your liking next time! Actually, I really did love it. Even though I cut the salt, this is my go to recipe and (unfortunately) it’s addicting. With that, I need to adjust my 3 star rating (I thought it noted 4 stars at the time). Let me know how I can edit the rating or if you can on your end to 5. Thank you! I love this recipe and have been making for about a year now. It’s my go-to breakfast. After becoming vegan, I was truly at a loss for breakfast ideas. I make veggie mixtures for my husband for work breakfasts, but I want something quick and fun. It’s way healthier than cereal, but lets me enjoy a breakfast similar to what the kids eat. It’s delicious! Thank you for sharing. As far as the negative comment about not wanting a cold breakfast, I laugh. Do you walk into a men’s clothing store and complain that there’s no women’s clothes? Calm down and be nice. Only look for recipes that fit your taste. Thank you, Jen! I really do appreciate it.